I ran over to Templemore again today to take my photos because Luis has laid down some cool things. I found a great little house that I will be camping in (unbeknownst to Luis). The Mesh Body Addicts fair opens August 1, and I put together this outfit from several pieces from the Fair. Romi Dagostino has this darling top and shorts set, available in several colorways, featured at the Fair. I clicked around to find the colors I liked and wore the two together. With a bow on the front of the shorts, they are cute but definitely not girly. 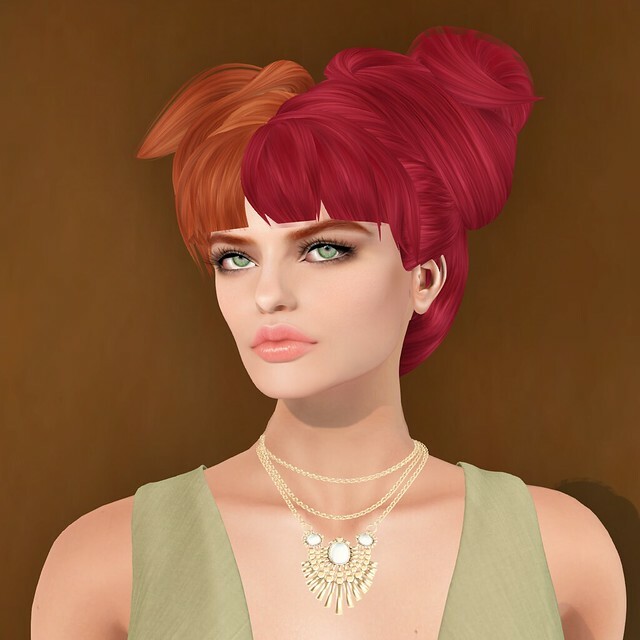 I matched up high heels for the Fair from Diamanda Allen that include a versatile color HUD and matched the studs to my awesome multi-layer necklace from Mirja Mills for We <3 RP. Aikea Reiko made awesome earrings for Shiny Shabby. I couldn’t help but use Catwa Clip’s new Destiny head for the Mesh Body Addicts Fair again. I love trying different skins on the head to see how they will look. Everything comes out looking great! Today’s choice is a great applier from Nicole Button. With her handy makeup HUD, I was able to add a fresh look without being overdone. Kuranosuke Kamachi’s gorgeous locks for Tres Chic complete the look.